Just so you know where we're coming from! This website is run by a committed Bible believing Christian from the UK. Its motto is 'Christian counter-culture youth work resources'. We are Holy Spirit-filled believers in Jesus who are passionate about young people, discipleship and relevant communication of God's truth - his Word, the Bible. Thanks to Andy H and especially Ben L who have helped with a number of sketches, games, sessions, ideas and more. This website is for the fame of Jesus and for his name alone. This site subscribes to the Evangelical Alliance statement of faith. Attend and involved at Exeter Network Church and help the ministry at CSA in Torquay. Have also served many other churches and Christians across the South West. Myfishbites.com has a Biblical Christian ethos based on an evangelical charismatic Christian faith. We work with all Christian denominations and all people (regardless of religion, no religion, lifestyle, race, gender, sexuality) to try and demonstrate integrity, quality, reliability and Christ's love through this site and our lifestyle. What we aim to present on this website is God's truth in love. Where we get that wrong, we're sorry! 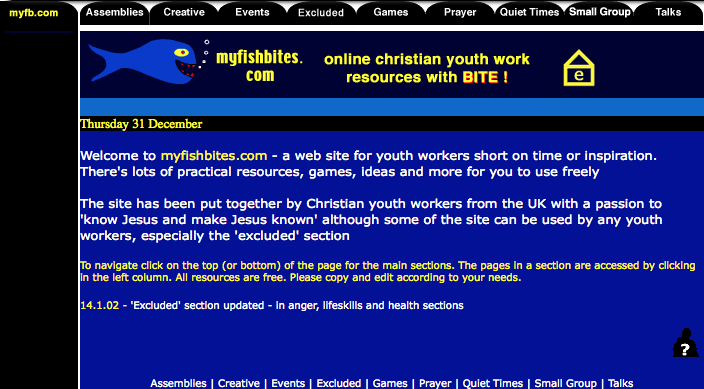 Myfishbites intends to be a resource for youth work and the local church, serving God as he leads. Regularly attend and serve at my church in worship, tech, Bible events and as part of the leadership team of a small group. Accountable to a small group of guys too. Heart is to serve and encourage! Work experience includes working as a youth pastor; working as the senior youth leader; set up 2 regular youth work events; part of team running evangelistic youth event for 9 years; helping with many inter-church events; running many youth events; working for Christian schools project; working as a Teaching Assistant in high school; working as a school chaplain in two schools; worked as part of behaviour team; helped to set up an inclusion unit in a school youth club. Having taken many assemblies, lessons, dramas, sketches, events, music, school trips, weekend aways, youth events, outdoor activities and more. Worked as a detached youth worker; worked on a bus; trained young people in MC-ing, DJ-ing, trained up 3 bands and others in tech and video. Hugely involved in worship - leading worship, production of backing tracks, lead guitar, bass, keys. Part of several 24/7 worship and prayer events. Help run tech and worship at churches, helped with the formation of the Exeter House of Prayer and run a digital media business. Have a calling to music, worship and serve as a worship leader and on lead guitar at various churches in Devon, open air worship and other events. 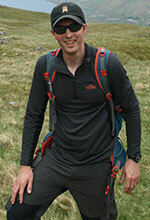 Speak in various churches and youth events including a Scout event. Help CSA with weekly meetings, conferences and other teaching events. Myfishbites strongly believes in not just giving money and time, but in being whole life disciples who cheerfully and joyfully give, as the Bible says, as led by the Holy Spirit. The projects we support can be found on the links page. To all those who have helped in the development of www.myfishbites.com over the last few years. I hope I have credited all of you. I want to credit everyone (adults and young people) who have been involved in coding, assembling, writing, supporting. Thanks to my parents and my sister for their total support and Godly wisdom. Thanks to those of you who have visited this site. Thanks even more to those who keep coming back! Most of all I give my thanks and shouts up to the awesome God, one in three and three in one. Thank you Jesus for dying, rising and calling me. Thank you for inspiring. This is all about and for you.